This sculpture of Nelson Mandela is in Kirstenbosch National Botanical Garden, which is on the eastern slopes of Cape Town’s Table Mountain in South Africa. Mandela is considered a national treasure and is featured in art and sculpture throughout South Africa. Kirstenbosch, established in 1913, was the first botanic garden in the world to be devoted to a country’s indigenous flora. Nelson Mandela is celebrated in sculpture and art throughout South Africa, where he is known as the “Father of the Nation.” I photographed a few pieces of this art on a recent trip. Mandela was President of South Africa from 1994 to 1999, the first to be elected in a fully representative, multiracial election. This print of Nelson Mandela was for sale in an art gallery in Camps Bay, South Africa. Sorry abut the glare. Internationally acclaimed for his anti-colonial and anti-apartheid stance, Mandela has received more than 250 awards, including the 1993 Nobel Peace Prize and the U.S. Presidential Medal of Freedom. A political activist against apartheid, Mandela was imprisoned for twenty-seven years, including eighteen years on Robben Island, which is just off of the Victoria & Alfred Waterfront of Cape Town. Boat trips from the Nelson Mandela Gateway on the waterfront take visitors to the prison on Robben Island, which is now a museum. Here’s a popular photo stop at the Victoria & Alfred Waterfront in Cape Town, which features statues in Nobel Square of South Africa’s four Nobel Peace Prize winners – Albert Luthuli, Desmond Tutu, F. W. de Klerk and Nelson Mandela. I’m not sure what the red sculpture is behind the Nobel statues. I think it has something to do with Olympic Medals that South Africa won in 2012. Does anyone know? I saw photos of the red sculpture under construction from 2010, so it’s relatively new. In the distance is the iconic Table Mountain. From Signal Hill, you can see Robben Island near the horizon, in Table Bay off the coast of Cape Town, South Africa. Nelson Mandela was imprisoned for eighteen years on Robben Island. A sculpture of Nelson Mandela dominates the square named after him in Sandton City, an upscale shopping center in Johannesburg, South Africa. A sculpture of Nelson Mandela is a backdrop to a newscast in Nelson Mandela Square. The square anchors Sandton City, a popular upscale shopping center in Johannesburg, South Africa. This sculpture of Nelson Mandela, created from tens of thousands of tiny beads, is popular with tourists traveling through the Johannesburg, South Africa airport. There are often lines as people wait their turn to get their photos taken. Bead sculpture in all sizes is a popular art form in South Africa. “We hold these truths to be self-evident: that all men are created equal; that they are endowed by their Creator with certain unalienable rights; that among these are life, liberty, and the pursuit of happiness.” ~ Thomas Jefferson, author of the Declaration of Independence. 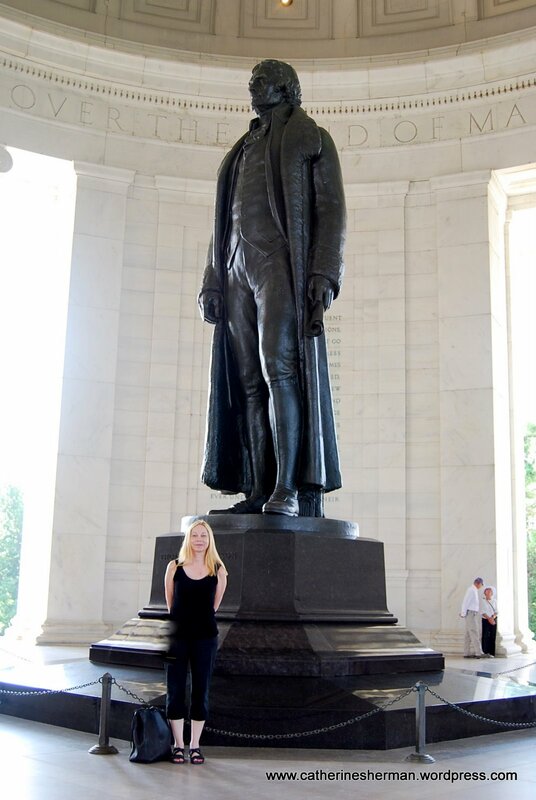 I’m sure I’ve been smitten with Thomas Jefferson ever since my parents first took me as an infant to the Jefferson Memorial, where the great man’s statue towered over me the way he does over United States history. 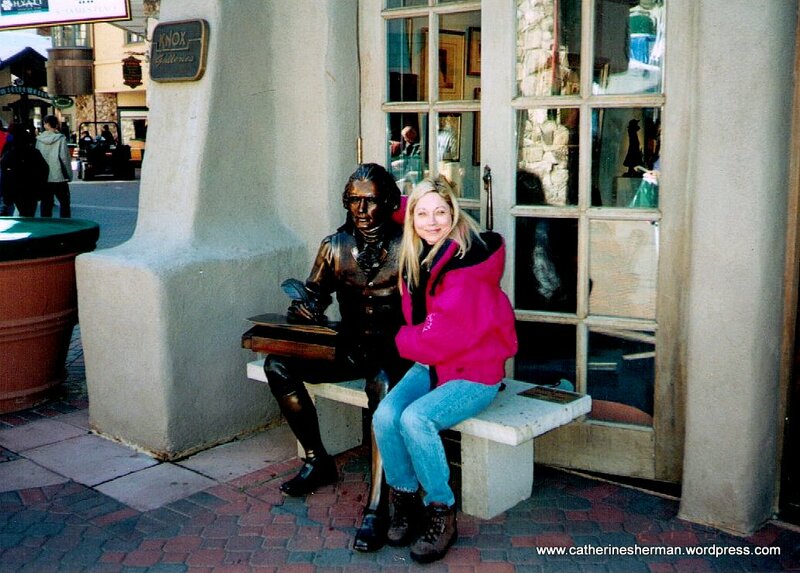 We also visited Mount Rushmore many times in the Black Hills, where my father’s family lived, and Jefferson’s sculpture there loomed even larger. After an introduction by my parents, Tom and I meet! It would have been love at first sight if I could have kept my eyes open. Jefferson’s birthday on April 13th is a holiday for me. Happy Birthday, Tom! Thomas Jefferson wouldn’t have welcomed any attention to his birthday, however. “In 1803, citizens of Boston wrote a letter to President Thomas Jefferson asking to make April 13, his birthday, a holiday. 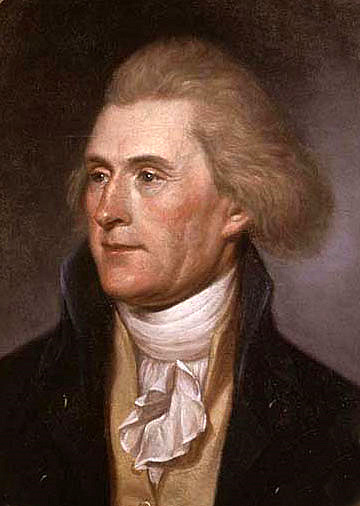 Jefferson courteously turned them down, saying he disapproved of ‘transferring the honors and veneration for the great birthday or our Republic to any individual.’ For the rest of his life, he refused to reveal to the public the day he was born,” wrote Peter Gibbon in an article published in the Philadelphia Inquirer in 2007. Among his many political offices, Jefferson was the third U.S. President, second vice president, first Secretary of State, Ambassador to France and Virginia’s second governor. Jefferson was cofounder and leader of the Democratic-Republican party, which favored states’ rights, while the Federalists favored a strong national government. These differences continue in some form in the U.S. political parties today. Years after our first meeting, here are Tom and I on another date. I should have worn heels. My friend Anita captured this moment. Accomplished in many fields, Jefferson was a horticulturist, political leader, diplomat, attorney, architect, archaeologist, paleontologist, inventor, and founder of the University of Virginia. He played the violin and was a dedicated diarist of his daily life. He was a brilliant writer. He invented many conveniences and devices, such as the swivel chair. The entry hall of Monticello contained a natural history display of items collected by Lewis and Clark on their expedition, and which are now re-created in a display for visitors to see. Thomas Jefferson by Charles Willson Peale, 1791. Scholars rank Jefferson as one of the greatest of U.S. presidents. How did Jefferson view his own accomplishments? It was Jefferson’s wish that his tomb stone reflect the things that he had given the people, not the things that the people had given to him, so his epitaph at his burial place at Monticello reads: HERE WAS BURIED THOMAS JEFFERSON, AUTHOR OF THE DECLARATION OF AMERICAN INDEPENDENCE, OF THE STATUTE OF VIRGINIA FOR RELIGIOUS FREEDOM AND FATHER OF THE UNIVERSITY OF VIRGINA. However, not everyone appreciated Jefferson’s many gifts, talents and contributions. In his own time, members of the rival Federalist Party called Jefferson the Antichrist. Though he was a brilliant writer, he was a poor public speaker and had a lisp. His estate at Monticello never earned enough to pay his expenses, and he was forced to pay the debts of others, as well. At his death, his estate and its belongings were sold. Jefferson liked to live well, introducing exotic foods such as olives and capers and serving French wine nearly every night. He introduced many new crops and tried to grow grapes for wine, but they didn’t prosper. There were plenty of political guests to be entertained, which caused him to go deeper and deeper into debt each year because his salary didn’t cover the bills. He agonized over both personal and public debt. These days, our top leaders jet around and entertain at public expense. My husband surprised me with a trip to Monticello for the 250th anniversary celebration of Thomas Jefferson's birthday in 1993. (The trip just happened to coincide with a Grateful Dead concert in Washington , D.C., that we also went to.) Years earlier, we'd driven to Monticello as part of our honeymoon, made it to the parking lot, but both were so stricken with colds that we lacked the strength to even go inside. He knew I'd always wanted to go back. 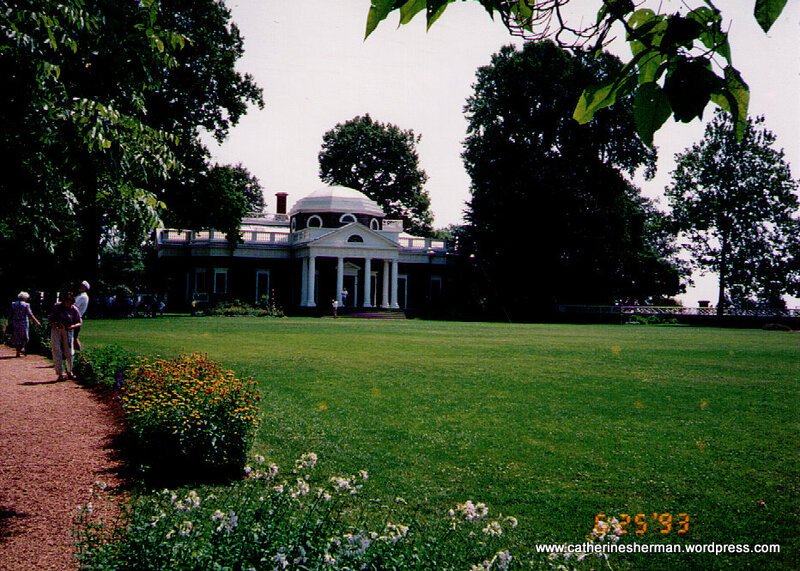 His beloved home Monticello was designed on neoclassical principles. Jefferson constantly worked to improve it over the more than forty years he lived there. After his return from France, he added the dome. It looks much larger than it actually is, perhaps because of its stately lines. A private non-profit organization, the Thomas Jefferson Foundation, operates the houses as a museum. Monticello is the only private home in the United States that is designated as World Heritage Site. Jefferson loved books. After the British burned Washington, D.C. and the Library of Congress in August 1814, Jefferson offered his own fifty-year collection of books to the nation to rebuild the Library of Congress. Congress accepted his offer, appropriating $23,950 for his 6, 487 books. After watching the carts haul away the books, Jefferson wrote to his old friend and one-time adversary John Adams, “I cannot live without books.” He immediately began to buy more. I know how he feels. I can’t imagine life without them and am now sure that I’d feel the same way about books on electronic devices. I need the smell, the feel, the bulk of them lined up on my shelves. Jefferson was widely knowledgeable about a great deal of topics and liked to expound on them. A recent book has even suggested that Jefferson had Asperger’s Syndrome, a form of autism. I doubt it, but the author, who lived in my area, made an interesting case for it. “I never considered a difference of opinion in politics, in religion, in philosophy, as cause for withdrawing from a friend,” Jefferson wrote, but he had his differences and fallings out with friends over politics, including John Adams. Years later, mellowed with age, Jefferson and Adams resumed their friendship by letter. On July 4, 1826, at about the time Jefferson died, Adams whispered, “Thomas Jefferson survives.” Adams died later that same day, the Fourth of July. The spirit of Jefferson does survive. 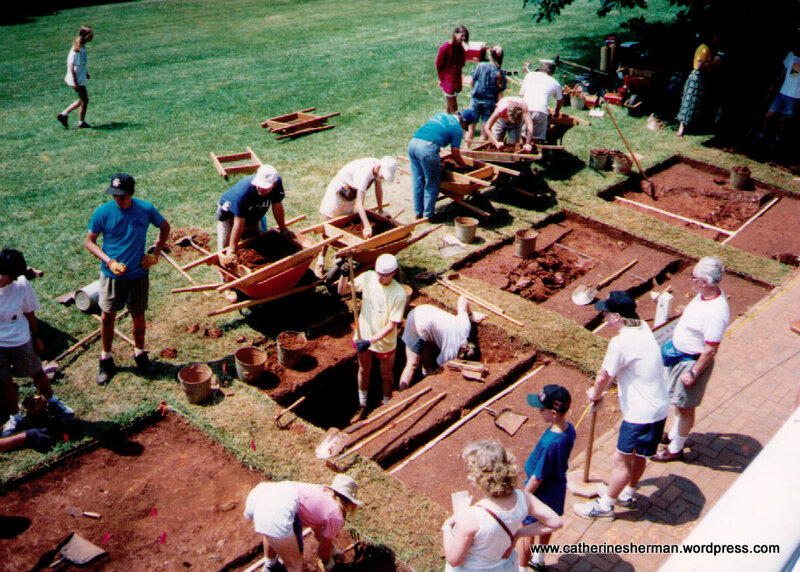 Here in 1993, researchers dig and sift the dirt around Monticello to look for household goods and other items from Jefferson's time. Some of Jefferson’s opponents accused him in print of being an alcoholic and of other moral weakness, which may explain Jefferson’s ambivalence about newspapers. He also used them against others, as well. This time, Tom brought along some of his stellar presidential friends. 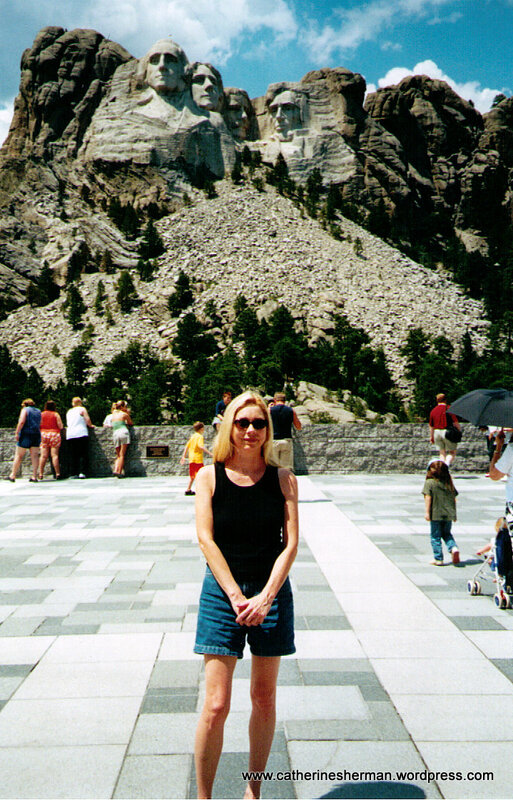 I've been making this pilgrimage to Mount Rushmore in the Black Hills of South Dakota since I was a toddler. (I'm not sure it's such as good idea to blast giant sculptures in a mountain, but it was a great childhood memory.) UPDATE: On the April 16, 2010, episode of Jeopardy (my favorite show) there was a question about Jefferson's position on Mount Rushmore. He was a strong advocate of educating the public, saying “Whenever the people are well-informed, they can be trusted with their own government.” and “Where the press is free and every man able to read, all is safe.” I wonder what he would make of today’s endless noise on the internet. Accusations against Jefferson about his alleged sexual liaisons were widely publicized as a way to discredit him. He denied them or ignored them, but some, such as his relationship with his slave, Sally Hemings, were very likely true. DNA analysis of Sally’s descendants show that they are related to at least some member of Jefferson’s family. Jefferson’s granddaughter pointed the finger at another family member as the father of Sally’s children. Even if the rumors had not been true, Jefferson, the fervent writer of documents on freedom, was a slave owner. He was troubled by slavery but only freed seven of his slaves, two during his lifetime, all probably related to him. Although Jefferson was an outspoken abolitionist, biographers have pointed out that his slaves were encumbered by debt and mortgages, which Jefferson never overcame. Tom and I enjoy some quiet time together after a busy day on the slopes at Beaver Creek, Colorado. Tom finally got to see the great West that fascinated him so much. Of course, he's writing about it here. Further ickiness: Sally Hemings was the half-sister of Jefferson’s wife Martha. Three-quarters white, Sally was said to look very much like Martha, who was long dead before Sally entered the Jefferson household. While a Virginia legislator, Jefferson succeeded in passing an act prohibiting the importation of slaves but not slavery itself. On March 3, 1807, Jefferson as president signed a bill making slave importation illegal in the United States. 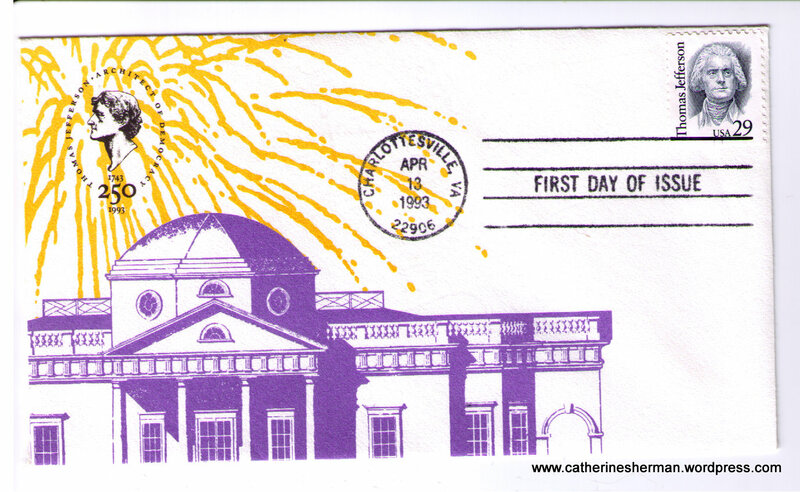 Here is a Thomas Jefferson First Day of Issue Stamp. I think I bought it in the Monticello gift shop. 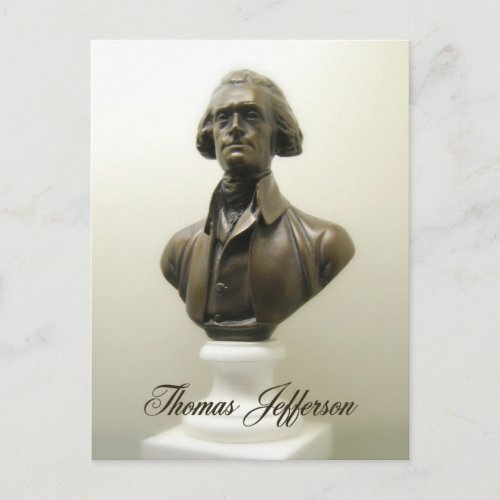 Jefferson and Monticello have been featured on several stamps. Jefferson is portrayed on the U.S. nickel and the two-dollar bill. Jefferson favored states’ rights and a strictly limited federal government, yet one of his most significant acts as president was the Louisiana Purchase in 1803 of 828,800 square miles of territory from Napoleon Bonaparte. This purchase now comprises 23 percent of the current United States. Many Americans opposed the purchase as being possibly unconstitutional. Jefferson himself thought that the U.S. Constitution did not contain any provisions for acquiring territory, but he decided to purchase Louisiana to prevent France and Spain from having the power to block American trade access to the port of New Orleans. Jefferson believed that a U.S. President did not have the Constitutional authority to make such a deal. He also thought that to do so would erode states’ rights by increasing federal executive power. But the potential French threat outweighed his constitutional queasiness. Additionally, Jefferson had always been fascinated by the west and its people and animals and began drafting plans for a western exploration as early as 1793. Immediately after his election, he began to plan for an expedition to explore as far as the Pacific, so the prospect of buying the land from the French must have been irresistable. In 1803, Jefferson sponsored the Lewis and Clark expedition to explore this newly purchased land. 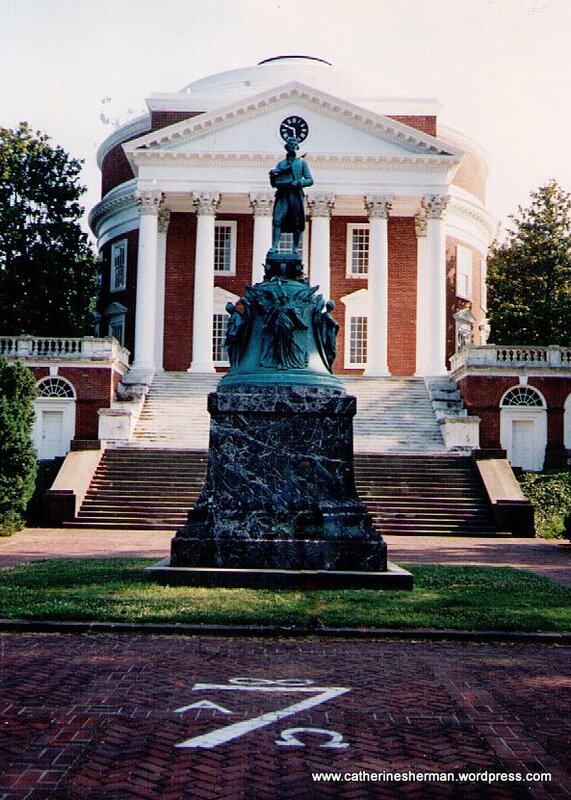 Thomas Jefferson founded and designed the buildings of the University of Virginia, Charlottesville. Along with Monticello, the University of Virginia is one of only three modern U.S. sites designated as a World Heritage Site. Of this University, Jefferson explained, "This institution will be based on the illimitable freedom of the human mind. For here we are not afraid to follow truth wherever it may lead, nor to tolerate any error so long as reason is left free to combat it." The University also followed the direction that higher education should be completely separated from religious doctrines. Maria and Jefferson spent almost every day together for weeks in Paris, which could partly explain Jefferson’s love of that country, if not its government. Once while dashing to his carriage to meet Maria, Jefferson fell and broke his right wrist, which made playing the violin very difficult after that. He wrapped his wrist and went ahead to meet her, despite the agony. Later, struggling to write with his left hand, he penned his now famous “My Head and My Heart” letter to Maria in which reason battled emotion. Jefferson, at 29, married the 23-year-old widow Martha Wayles Skelton. During their ten years of marriage, they had six children, but only two survived to adulthood, including the oldest, Martha Jefferson Randolph. Jefferson’s wife Martha died on September 6, 1782, after the birth of her last child. Jefferson never remarried, honoring his wife’s deathbed wish. He destroyed all correspondence between them. After his wife’s funeral, Jefferson refused to leave his room for three weeks. Then he spent endless hours riding horseback alone around Monticello. He didn’t resume a normal life until mid-October, but suffered from depression for years afterward. Martha Randolph, who had twelve children, was considered the third First Lady, acting as hostess to her father, because her father was a widower. A great website is Monticello — The Thomas Jefferson Foundation. Additionally, I’ve selected many of Jefferson’s quotes, all of which I think ring true today. 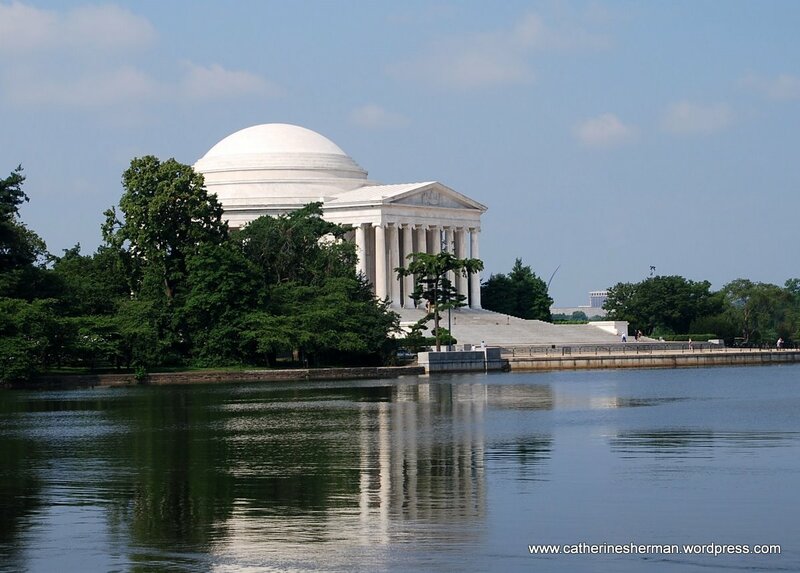 On my most recent visit to Washington, D.C., with my friend Anita, I finally visited the Jefferson Memorial -- the first since I lived in Alexandria, Virginia, as a baby. The dome of the Jefferson Memorial suggests the one topping Jefferson's home, Monticello. A wise and frugal government which shall restrain men from injuring one another, which shall leave them otherwise free to regulate their own pursuits of industry and improvement, and shall not take from the mouth of labor the bread it has earned-this is the sum of good government. I have come to a resolution myself, as I hope every good citizen will, never again to purchase any article of foreign manufacture which can be had of American make, be the difference of price what it may. General Washington set the example of voluntary retirement after eight years. I shall follow it. And a few more precedents will oppose the obstacle of habit to any one who after a while shall endeavor to extend his term. I never told my own religion, nor scrutinized that of another. I never attempted to make a convert, nor wished to change another’s creed. I have ever judged of others’ religion by their lives…for it is from our lives and not from our words, that our religion must be read. Were it made a question whether no law, as among the savage Americans, or too much law, as among the civilized Europeans, submits man to the greatest evil, one who has seen both conditions of existence would pronounce it to be the last; and that the sheep are happier of themselves, than under the care of wolves. Were it left to me to decide whether we should have a government without newspapers, or newspapers without a government. I should not hesitate a moment to prefer the later. When angry, count ten before you speak; if very angry, an hundred. I have ever deemed it fundamental for the United States never to take active part in the quarrels of Europe. Their political interests are entirely distinct from ours…They are nations of eternal war. All their energies are expended in the destruction of the labor, property and lives of their people. We are not to expect to be translated from despotism to liberty in a feather bed. Original Wizard of Oz book. Actually, I am in Kansas right now, but I couldn’t resist that statement, and I’m not alone. It’s a very popular phrase to explain wonderment when entering a fantastic new environment. Recently I saw a version of the phrase in the New York Times Coming-of-Age Filmgoers: You’re Not in Kansas Anymore, which had nothing to do with the movie or the book. Growing up in Kansas, I was always fascinated by The Wizard of Oz movie, even though it didn’t show our state in a very favorable light. However, as black and white, dusty and tornado-prone as Kansas was shown in the movie, Dorothy couldn’t wait to get home! 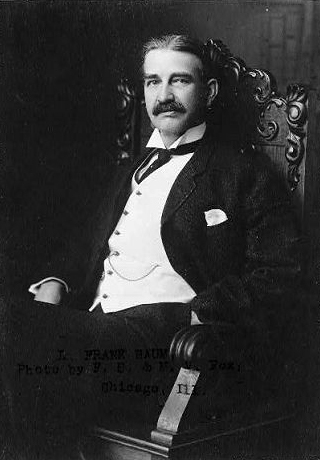 L. Frank Baum, the author, never visited Kansas but fashioned the Kansas in his book, published in 1900, after the drought years he experienced when he lived in Aberdeen, South Dakota. I didn’t interpret the movie (I hadn’t read the book) as anything more than a fantasy, until I got to college. There, I learned that like most fairy tales, there is a deeper interpretation, usually something sinister or despotic. In these times of great economic uncertainty, I thought it might be helpful to take you back to the good old days of the 1890s, depicted as allegory in “The Wonderful Wizard of Oz.” The “Gay Nineties” period was really a time of widespread economic depression in the United States, set off by the Panic of 1893. The depression lasted until 1896, when the Republican Party took control of the White House. Full prosperity didn’t return until 1899, which didn’t last, of course. Boom and bust times continue, most notably The Great Depression. Henry M. Littlefield wrote an essay in 1964 called “The Wizard of Oz: Parable on Populism,” which showed that the people and events in the book were metaphors for actual people and events in the 1890s. 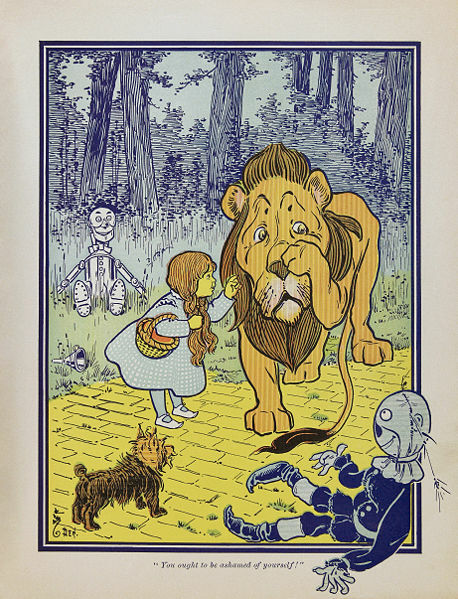 Dorothy meets the Cowardly Lion in an illustration from the first edition. “Many of the events and characters of the book resemble the actual political personalities, events and ideas of the 1890s. The 1902 stage adaptation mentioned, by name, President Theodore Roosevelt, oil magnate John D. Rockefeller, and other political celebrities. (No real people are mentioned by name in the book.) 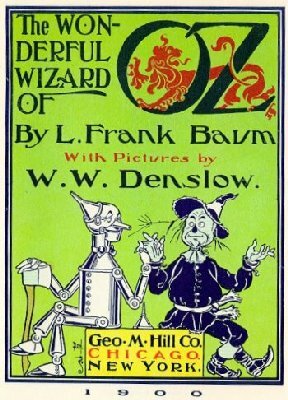 Even the title has been interpreted as alluding to a political reality: “oz.” is an abbreviation for ounce, a unit familiar to those who fought for a 16 to 1 ounce ratio of silver to gold in the name of bimetallism In the play and in later books Baum mentions contemporary figures by name and takes blatantly political stances without the benefit of allegory including a condemnation in no uncertain terms of Standard Oil. The book opens not in an imaginary place but in real life Kansas, which, in the 1890s as well as today, was well known for the hardships of rural life, and for destructive tornadoes. 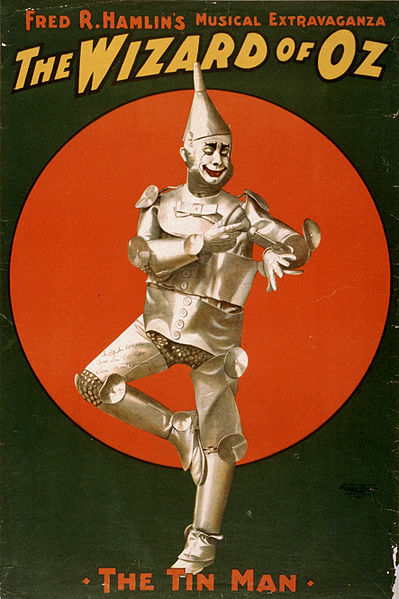 1903 poster of Dave Montgomery as the Tin Man in Hamlin's musical stage version. 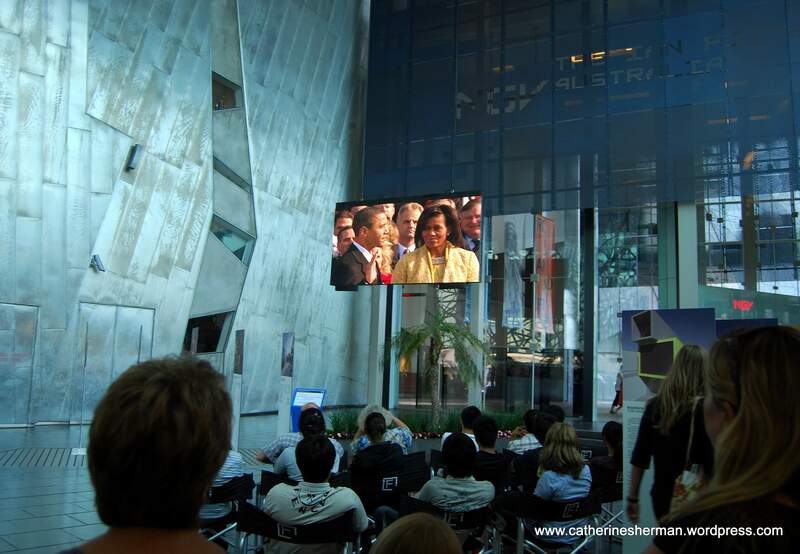 On January 21, 2009, in Federation Square in Melbourne, Australia, people gather to watch a re-broadcast of Barack Obama taking the oath of office to become the President of the United States. Outside, another group is watching The Australian Open Tennis Tournament on a giant screen. The tournament was going on at nearby Rod Laver Arena. Wouldn’t it be great if journalists in the United States would grill our politicians and bureacrats like this! This interview reminded me of a Monty Python skit on steroids. Despite the pathetic John Hirst in this video, Great Britain has contributed mightily to the world of meterology and travel. English clockmaker John Harrison (1693-1776) invented the marine chronometer, a long-sought and critically-needed key piece in solving the problem of accurately establishing the East-West position, or longitude, of a ship at sea, thus revolutionizing and making long distance sea travel more safe, according to Wikipedia. Read the fascinating book about this by Dava Sobel, link below. Vice-Admiral Robert Fitzroy of the Royal Navy(1805 – 1865) the captain of the HMS Beagle during Charles Darwin’s famous voyage, was a pioneering meteorologist who made accurate weather forecasting a reality, according to Wikipedia. Wikipedia isn’t always reliable, but I think we’re safe here. I found the viedo above, thanks to a commenter on the meteorology blog “Watts Up With That?” which you can find in my blogroll. Also, a site I recently discovered about journalism is “Big Journalism.” I’ve added it to my blogroll. Check it out. John F. Kennedy’s opening statement during the 1960 presidential debate. My first airplane trip, my first (and, thankfully, only) airplane emergency landing and my “sighting” of John F. Kennedy all happened on the same day. That day began my fascination with politics. Fortunately, it didn’t dampen my enthusiasm for travel, either. November 20, 1959. I was seven years old. My father’s father had just died, and my mother, baby brother and I were on our way to the funeral in Sturgis, South Dakota. My father and a sister and brother were already there. I missed my grandpa, but I was excited about my first airplane ride. A poster like this one greeted my mother and I at the Wichita, Kansas, airport, in November 1959. Kennedy had stopped by to speak to supporters. Our trip began at the airport in Wichita, the air capital. My father was an engineer for Boeing in Wichita, and his enthusiasm for airplanes was infectious. Airplanes roared overhead all day, every day. I loved the noise. It thrilled me. Now I was going to fly in one of “my father’s” airplanes. As we walked to our gate, my mother paused at a poster of a man with a huge smile. Kennedy hadn’t officially announced — he’d do that in January 1960 — but he was gathering support across the country. I’d heard his name during the last time we’d visited my grandfather as the relatives talked about current events. Here was a Catholic candidate who had the first real chance to be president. I wasn’t sure what the problem was. Nearly everyone I knew was Catholic. How could that be bad? Even so, not all of my Catholic relatives voted for Kennedy, I later learned. They didn’t let religious affiliation trump their political views, although they felt an affinity to Kennedy. As Catholics, my relatives were also talking about the Third Secret of Fatima, which was supposed to be revealed in 1960. What was the secret? Would the Soviet Union be converted to Christianity? Would it be the end of the world? I was fascinated and scared. We settled into our seats on the TWA Boeing jet. The first leg of our trip would take us to Denver. My mother held my nine-month-old brother as we buckled in and waited to take off. “Do you see Kennedy?” my mother asked, looking out the window of our airplane. I saw a large crowd gathered on the pavement beyond our airplane. 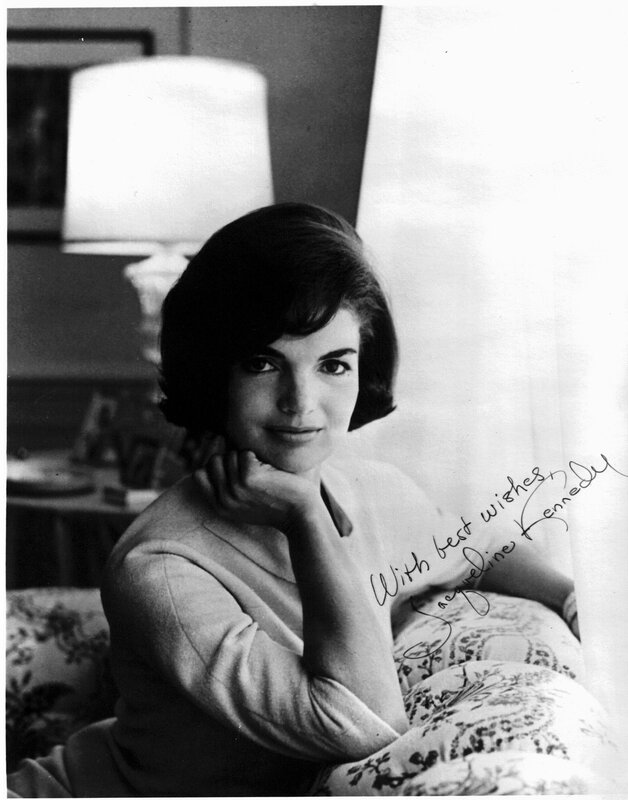 After Kennedy was assassinated, I mailed a drawing and a letter of condolence to Jackie Kennedy. Like the rest of the country, I was deeply shocked by his death. I received this photograph in return. I was eleven. Everyone was so small, I couldn’t tell one person from the next. I nodded anyway. I wanted to think I saw him. I definitely was going to tell all of my friends at school that I had. I didn’t realize we were witnessing the beginning of a new age in campaigning. Kennedy and his staff used all the modern tools of the day: air travel, television, advance men who arranged for huge, friendly crowds to meet him and then make sure these crowds were depicted in the news. It was the first modern campaign, according to Gary A. Donaldson, who wrote a book by the same name. My mother, brother and I took a Frontier propeller airplane from Denver, headed for Rapid City. A stewardess came by, offering us water, milk or hot cocoa. She also asked us in Spanish and French. We hadn’t been in the air very long, when smoke started to fill the airplane. One of the engines was on fire. The pilot made an emergency landing in Alliance, Nebraska, where we crammed into a tiny airport for twelve hours. At first there was nothing to eat but glazed donuts brought in from a nearby shop. Later, sandwiches were delivered, but I was already stuffed on donuts. (Homer Simpson would be proud.) I didn’t have anywhere to sit so I lay under my mother’s chair. She had my baby brother to tend to. Now that I’ve had my own children, I know how stressful the experience must have been. I was so excited when I saw this envelope (cropped) in the mail. I wondered why there wasn't a stamp or a postmark, but my mother explained that the envelope was "franked" with Jacqueline Kennedy's signature. Jackie Kennedy was allowed to mail envelopes without a stamp to respond to all of the people who wrote to her with their condolences. We finally made it to Rapid City on another airplane. When we got there, we found out that the airline had told my father that we were spending the night in Nebraska, so he’d left. Luckily, a family friend who’d been on our flight from Denver drove us to Sturgis, where we met my father and grandmother at my grandparents’ hotel. It was one of the last times I’d ever stay at the Fruth Hotel, a scene of so many happy childhood memories. We said good-bye to my grandfather, who had been an important figure in my life. You don’t forget something like an engine fire, but even at my young age I realized that Kennedy was the most exciting part of the flight. Everyone at St. Mary’s grade school was excited about Kennedy’s candidacy when he finally announced it. Even though I was just a second-grader, I felt I was a part of history because I’d kind of, sort of, maybe saw Kennedy. Students named Kennedy and Nixon attended our grade school, so we had informal mock elections. Even though it was a Catholic school, we were in a Republican state, so it wasn’t entirely one-sided. 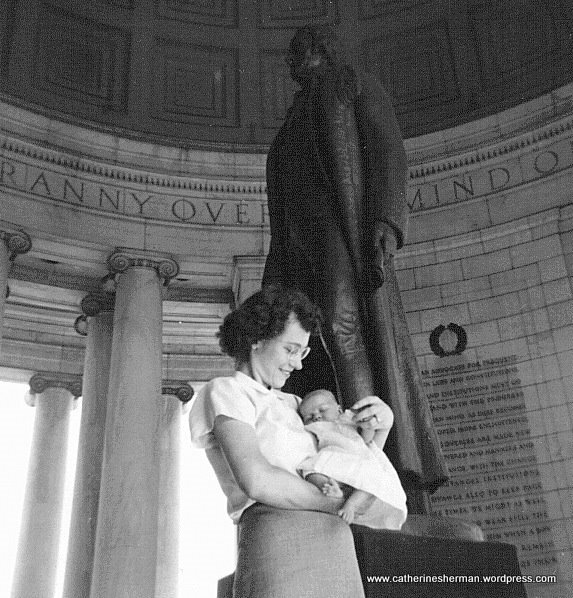 My parents had followed the career of Dwight Eisenhower when we lived in Alexandria, Virginia, where I was born. They had gone to the airport once to see him arrive with Mamie and get into a limousine. And now we lived in Eisenhower’s state. Jackie Kennedy: A Front Runner's Appealing Wife. Life Magazine, August 24, 1959. The students in my school cheered when Kennedy was elected. His words “Ask not what the country can do for you, but what you can do for your country” rang across the country and are still often repeated. This was the time in my life when I began to look to the wider world. It was an awakening, which was both engrossing and frightening. A couple of months after his inauguration, Kennedy established the the Peace Corps. The Bay of Pigs invasion disaster a few months later in April 1961 took the shine off of the new president’s glow. More anxiety was created when the The Berlin Wall appeared on August 13, 1961 (my birthday). We trooped to the school cafeteria to watch rockets launched into space. We worried about the Soviet Union surpassing us in the space race. John Glenn orbited the earth in 1962. Also in 1962, The Cuban Missile Crisis was the first time I was really frightened and realized that the world could be a very dangerous place. There was a growing interest in fallout shelters. Eighteen Titan II Intercontinental Ballistic Missile (ICBM) complexes were located in the farmland around Wichita, adding to our anxiety. (I later toured a silo with my Girl Scout troop during high school.) We knew that nearby McConnell Air Force Base and Boeing’s military airplane factory could be targets. 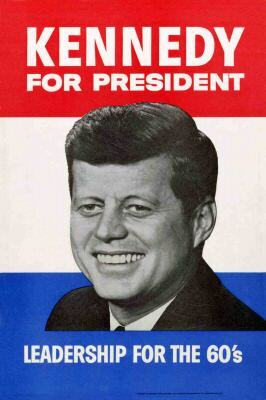 There were many who didn’t like Kennedy and much we didn’t learn about until later, but in my world, his presidency marked the first and last time I was enthusiastic about a president. Perhaps, it was the naivete of youth. Cynicism creeps in as you realize how fallible our leaders are. The Vietnam War darkened my outlook even more. 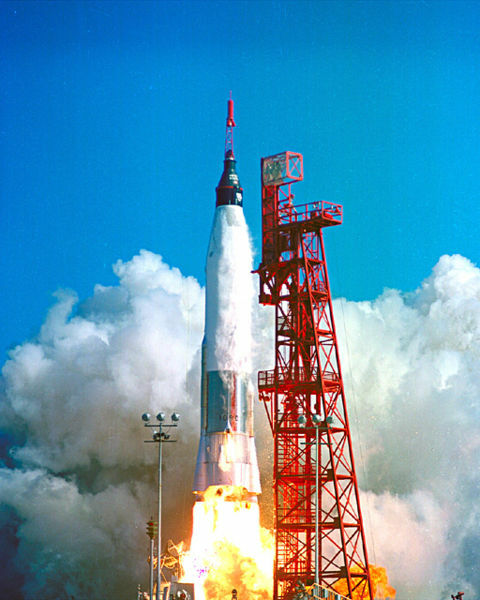 The launch of astronaut John Glenn's "Friendship 7." The American people fell in love with Jacqueline Kennedy. Her charm, beauty, sophistication and glamor was as appealing, if not more so, than her husband’s. I was crazy about her, myself. Jackie Kennedy seemed to be on the cover of every popular magazine. She wanted to make sure the White House was a private home for her family but recognized that it as also a national institution. She formed the White House Historical Association to help in restoring the building. Her filmed tour of the redecorated White house was broadcast to 50 million people on television on Valentine’s Day 1962. I was one of those 50 million. She received an honorary Emmy Award for her achievement. I remember her efforts towards the preservation of Egyptian antiquities from the flood waters of the new Aswan Dam in Egypt. I became very enthusiastic about Egypt when I saw it featured in Life Magazine, a major source of my news about the world (along with National Geographic.) I became enamored of Elizabeth Taylor and her role as Cleopatra. 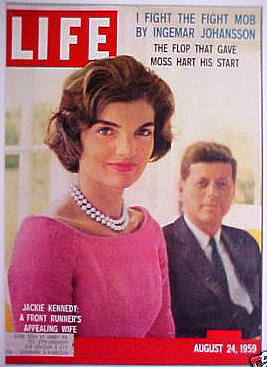 She and Jackie seemed to alternate on the cover of popular magazines. 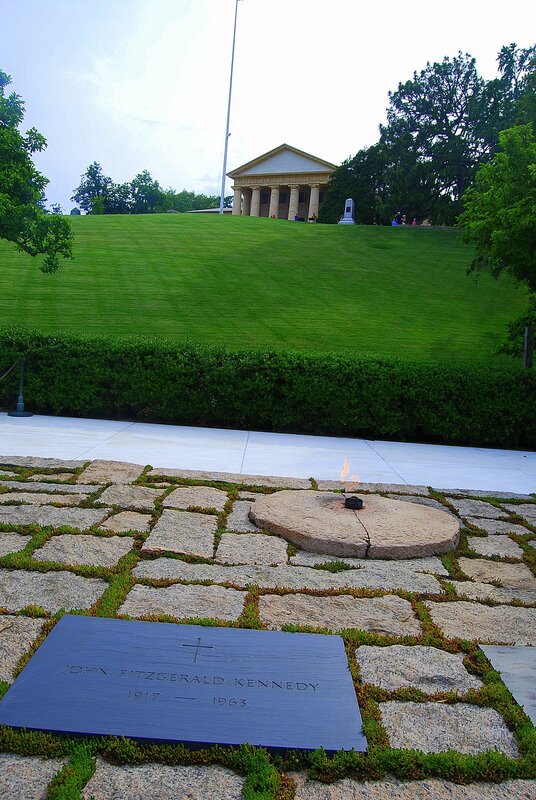 Jacqueline Kennedy requested the eternal flame for her husband's grave. Above is Arlington House, the home of Robert E. Lee, who left it at the onset of the Civil War. He and his family never returned, and now the land is the site of the national cemetery and the Pentagon. I visited Arlington for the first time as an adult this year. Four years after that day at the Wichita airport, I was cutting out paper turkeys in my sixth grade art class for Thanksgiving decorations when an ashen-faced Sister Kathleen came into our classroom to tell us that President Kennedy had been shot. It was November 22, 1963. Over the next few days, we were in shock as we watched the events unfold on television. Lyndon Baines Johnson was sworn in, Jack Ruby shot Lee Harvey Oswald, the funeral cortege with Jackie, Caroline and little John John saluting as his father’s casket passed, the horse with the backwards boots. It was the first national mourning for a president on television. For more about John F. Kennedy, including links to audio and video clips, go to John F. Kennedy. Here’s a video about Jacqueline Kennedy, including her work on the restoration of the White House. The next video is more of the Kennedy-Nixon presidential debates.